Background: Years ago, John and others were told by Kuthumi to move some lines on the planet away from massive contamination, which they did. 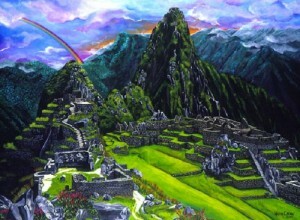 Stonehenge and Machu Picchu were a couple of the places. The entire planetary chakra system changes by moving these energy lines around the planet. Things need to change as we know. Things can’t stay the way they are. This is why change is necessary. Something happened on the way here today and since we arrived at Machu Picchu which surprised John. He has been checking and checking and checking it. What he is being asked to do now is to re-establish the energy lines here at Machu Picchu. This is no surprise someone in the group said, because so many people come here, and it’s such a point of transformation. I will now channel the spokesperson. The morning has passed according to the conventional method of time so, good afternoon. The way we measured our time is by the sun, so it would be morning. I am the spokesperson, again with you, and I have been detailed to speak with you on levels about your activities so far and results. You have now set your feet upon many holy places and sacred sites on this blessed land. Each and every one of you has made your own sacred contribution, and many of you know you have been walking in the footsteps of the ancients. It is now the time for you to understand a little more about your journey. Your journey has been for yourself, but not only for you. More importantly, it has been planetary, collective, universal, and more. On a planetary level, it’s now time for the re-establishment of the energies on this continent. In the days past, in the 1960’s, 70’s, and 80’s, it was the place of the magical isles of Ireland, England, and so on to hold those planetary energies. Then the focus was shifted across into western Europe to Holland, and then began to spread further east, and you can see that in the social and political structures of eastern Europe. In the meantime, there were more planetary changes, and you may or may not know that even the heart chakra of earth moved from sacred Glastonbury to Tibet and the Himalayas. So you can see many preparations have been made. I am only giving you a short explanation on the situation. The first recent preparations for this were during the 1914-18 war. Another war that finished in 1945 was the next level of preparation. These are only recent events. The preparation has been going on for thousands of years. Now it’s time for this continent to begin to take the lead in the movement forward of realization of consciousness and so on. Time for the above water areas of the planet to become more involved in the ascension and now time for this part of the above water land masses of this particular one to become more involved in the energetic process of the ascension. So it’s time to bring the energy lines back into cooperation with this place. Also, with the learnings you have to keep energy stable and over points and vortexes in self-clearing mode, the time has come. So this place is surrounded by mountains. These mountains are guardians or energetic keepers of the place, each and every one. They have been standing silently and patiently and sleeping soundly just waiting for them to do the job once more. First, we are going to pass on the wakeup call to the guardian mountains. With your outbreaths, see your lightbodies expand completely around this mountain upon which this sacred place (Machu Picchu) is situated. Expand, expand, expand. Do gentle breathing and allow each breath to expand. With your outbreaths, radiate out to these other mountains that surround the guardians/keepers, and breathe into the consciousness of each one and the consciousness of them all. Keep the focus in your hearts. Now the guardian mountains wake up. Each one of their main energetic vortexes activate down to the body of the mountain and activate with Earth Mother, connected with the central sun and heart of Source and cosmic heart of Source. Activate, activate, activate. In your mind’s eye, see that the space brothers and sisters have joined us, and are assisting these guardians in the activation. As we activate, they radiate into this mountain (Machu Picchu) on which we are. This goes into the underground city. Immediately, we have a million brothers and sisters gather around with their hearts and send it back. The center crystal grounded activates, activates, activates. Now with the ancient ones, priests, and priestesses, we will relink all energy lines from Mother Earth to the central pyramid. Breathe nicely. It will take some moments for the connections to re-establish. Now the next piece you can do in your minds. Affirm the connections are activated. Activated, activated, activated. Activate, activate, activate. The activity for this place besides the spokesperson will preserve the program for the main vortexes, and the lines that run through will be self-cleansing, and will continue to vibrate in the cosmic divinity of love. Thank you, my brothers and sisters, for participating and holding your focus as the cleansing rain falls upon you. I will be following you at your next stops as you descend down into the jungle. You can expect more rain, more humidity, and more transformation of the individual, but this, of course, merely makes your own holy vessel more ready, open, and willing to receive more and more. Blessings, blessed ones. I will retire from you, but thanks from all.